Android phones and tablets are rocking into the mainstream for stunning on-the-go video watching. Definitely, it's straight forward and cozy to get movies onto Android for playback. But for DVD fans, it's a little bit tricky to put DVD on Android phones and tablets. Luckily, there is an unwritten rule: choose a DVD ripper for Android to rip DVD to Android supported format. Wanna the best DVD converter for mobile device that works flawlessly for your Samsung Galaxy, HTC One, Google Nexus, Kindle Fire (HD), Asus Transformer, etc. In this article, we'll give the best DVD to Android converter review regarding DVD ripping features, speed and quality, and ease of use. As long as you keep the four essential factors in mind, you are for sure prone to get the top-notch software to convert DVD to Android tablet and smartphones with no hassle. The best DVD ripper for Android shall be true to its name. Specifically, it must be embraced with the basic DVD ripping features, letting you not only rip copy protected DVD including DVD encrypted by CSS, region code, Sony ARccOS protection, etc. but also rip DVD to all Android-based devices like Samsung Galaxy, HTC 10, Microsoft Surface Pro 4, Kindle Fire HD, etc at your disposal. DVD ripping speed shall be also focused on when ranking the best DVD ripper for Android. The fast speed is like ensuring that you use the best oil for your car. Will you be willing to wait a whole night only for the purpose of watching a 90-minute movie on Android? Meanwhile, a good DVD to Android ripper isn't worth its weight if you can't get a crisp video image. Supposing you've got the stunning Galaxy S9 in hand for new DVD movies entertainment, but your DVD ripper makes the converted movie nothing but blurry. It's really the rotten apple injures its neighbors. Bad navigation and non-intuitive interface are certainly deal-breakers for a DVD to Android converter. The best one shall be designed with intuition in mind because it leads to users easily operating and navigating the software without encountering any complications. From the abovementioned principles, a great number of DVD copy software designed for Android phones and tablets will be filtered out. Only the elites meeting all the standards survive, among which, MacX DVD Ripper Pro stands out from the crowd and unquestionably becomes the best DVD ripper for Android tablets and handsets. It helps to rip both homemade and commercial DVD to Android devices and iPhone, iPad, iPod, PSP, etc at lightning speed while holding the original video quality. Its intuitive interface is easier to start with, giving very straight-forward 4-step operation: one-click load DVD, one-click set format, one-click set output folder and one-click start ripping. Prior to DVD to Android conversion, you should download this DVD ripper on your Mac (macOS Mojave included); please download Windows version (Win 10 supported) if necessary. Install and run the Android DVD ripper on Mac, click "DVD Disc" to add DVD from DVD drive. Or click "DVD path" to import DVD from new movie DVD releases folder saved on your hard drive. To rip DVD to Android tablet, you can simple hit "Android Pad" to get the Android-based tablet such as Galaxy, Huawei, Sony, Xbox, Surface Pro, etc. Or just choose "Android Mobile" and select the specific Android phone like HTC, Galaxy, Huawei, Sony, Oppo, Xiaomi, Lenovo, Nokia, etc if you need to rip DVD to Android phone. Tips: the editing function makes you converted DVD movie more style. You can simply hit the "Edit" button at the right side of the DVD title. Click "RUN" to begin ripping DVD to Android on Mac. After finishing the DVD ripping task, if you want to replay DVD contents on iPhone iPad iPod mobile devices, you can take advantage of MacX MediaTrans iOS data manager to transfer the converted video to iDevices for enjoying on the move. 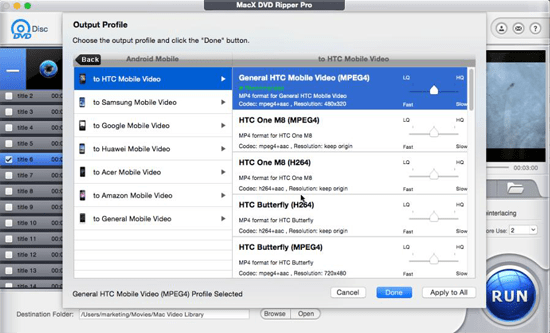 Besides ripping DVD to Android as you like, MacX DVD Ripper Pro also is professional in ripping DVD to Final Cut Pro, iMovie, iTunes, MP4, MOV, FLV, etc with few clicks. Notice: We only advocate using this best DVD ripper to rip commercial DVDs to Android under the concept of Fair Use and do not encourage any illegal reproduction or distribution of copyrighted content. Please abide by the local DVD copyright law before doing it.